Have you noticed droplets of water dripping from your ceiling recently? Or maybe from a light fixture? If so, you&apos;re not alone. The cold weather seen in February has been causing a phenomenon known as attic rain. That&apos;s when frost builds up in an attic during a cold snap — the result of condensation — then suddenly melts. "If you&apos;ve got a lot of moisture, you could potentially see several cups of water come out of your ceiling," Darrell Paul, a building envelope specialist with Qualistat Building Performance Consultants, told The Calgary Homestretch. "If you&apos;ve got just a little bit then it would probably just sublimate and evaporate back into the air before it caused any problems." Because of advances in energy efficiency, the problem is more pronounced in new homes, said Paul. "If you&apos;re probably within four years old you should be calling your builder of warranty provider because there is some envelope warranty on there that could be accessed," he said. "In the past, homes didn&apos;t have as much insulation in the attic, so the air was actually warmer, because of radiant heat loss from the house," said Paul. "Now, because of the insulation there&apos;s hardly any heat in the attic so as soon as [moisture] gets in there, it&apos;s frosting up right away." With this being the coldest February in decades, Paul said homeowners would be wise to check for moisture buildup. "It&apos;s a good idea if you have a home to poke your head up there and have a look because that&apos;s the easiest way to identify it. 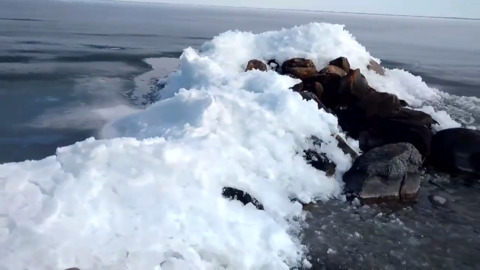 If you&apos;ve got a little bit of frost, less than a quarter of an inch on the surface, it&apos;s probably not going to create any problems … but if you see four, five, six inches of buildup, where the air is leaking is where the buildup is going to occur," he said. "So if you look across your ceiling and it seems fairly clear then over the left corner you&apos;ve got a buildup of six or seven inches, that&apos;s where the air leakage is and that&apos;s where the seal has to be fixed up in your house, so this is the easiest and simplest time to find that so it can be fixed." Original story on CBC.ca, with files from The Calgary Homestretch. Mountains of ice draw gawkers to Fort Erie, Ont.